Physical therapy is used by professional athletes, as well as amateur athletes and weekend warriors. When injuries keep them from doing their very best they can use our Doctors of Physical Therapy or our Board Certified Athletic Trainer to help identify the issue and get it corrected fast. 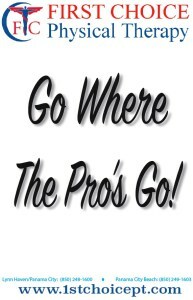 If the Pros trust us to get them back in the game, you know you can trust us to help you too! Call today 850-248-1600.